A newly formed migrant caravan of more than 2,500 departed the southern Mexican border in Chiapas Saturday and is now traveling north for the U.S. 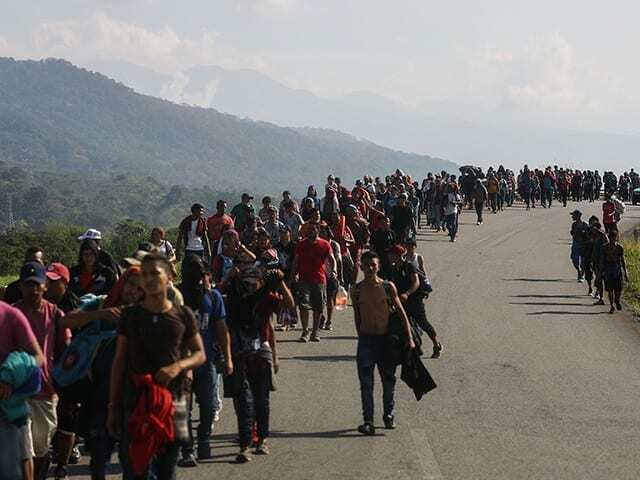 The group formed in Tapachula, Chiapas, over several weeks and is labeled the first Central American-Caribbean caravan since it includes a large number of Cubans. The caravan departed Saturday morning at approximately 4:30 am. They spent the first night in the town of Huehuetán and later the outskirts of Huixtla. The caravan planned to reach Mapastepec by Monday, which would total approximately 65 miles since their departure on Saturday morning. According to numbers released by Mexican immigration officials, the caravan consists of 1,199 Hondurans, 764 Salvadorans, 300 Guatemalans, 176 Nicaraguans, and 85 Cubans. Some expect the Cuban cohort to swell to 600 after immigration officials suspended the issuance of one-year humanitarian visas. The Mexican government said the visa program was suspended due to over-taxation of resources to process requests. The one-year humanitarian visas, promised by Mexico’s new President Andrés Manuel López Obrador, was a newly adopted policy which allowed migrants to legally travel and work during their stay in Mexico. The suspension stranded migrants from Nigeria, India, Cameroon, Congo, Angola, Nepal, and Haiti, according to Quadratin Chiapas. Earlier this month, Mexican President Andrés Manuel López Obrador authorized the deployment of a coordinated security operation with the military, state, and municipal police along the Guatemalan border to fight the increase in violent crime coinciding with the arrival of several caravans since October 2018. In February of this year, a suspected MS-13 member murdered two police officers and a rival gang member.